Launay Castle in France comfortably sleeps 14+2 people in the château and 2 in the guest house. Enjoy the large heated swimming pool, explore the many castles of the Loire Valley and return to the castle each night. The Chateau is in exquisite condition and is decorated with a combination of contemporary and period style furnishings. Each bedroom has its own en-suite bathroom. 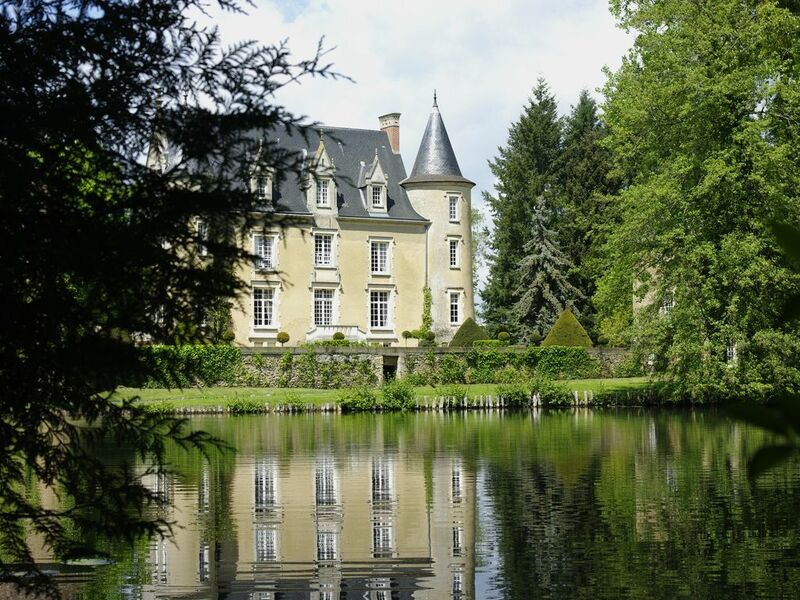 The chateau is situated on 36 acres of secluded property in Sarthe and is adjacent to Lombron, a charming village of 2,000 inhabitants, near Le Mans France in the Loire Region - la Région des Pays de la Loire. Read more about the Loire Valley Region which you can easily visit when staying at Launay Castle. The property includes beautiful tree-lined paths, an orchard and a one and a half-acre pond. The château is surrounded by a picturesque moat. Romantic History: The Château de Launay is also the home of a romantic story that involved the Seigneur de Luce, Charles de Coesmes and Gabrielle d'Harcourt. Their marriage in 1523 was initially disapproved by François 1er following the abduction of Gabrielle by Charles de Coesmes, who was aided by Pierre de Bernay, Seigneur de Launay. The couple took refuge at Château de Launay and subsequent events are known in great detail including quotes from the angry mother trying to fetch her daughter at night. But by 1527, because of services rendered by the seigneur and some say because of Gabrielle's remarkable beauty, the couple often joined the court of François 1er at Amboise and Chambord. Later the chatellenie de Luce was changed into a barony. Château de Launay is located in the Pays de la Loire region, within easy walking distance to the quaint village of Lombron, which has its own bakery, butcher, café-restaurant and pharmacy. Château de Launay is ideally located for innumerable interesting day excursions. -You will be able to explore the many castles of the Loire Valley and return to the castle each night. -Saumur, Vouvray, Jasnieres and Côteaux du Loir are some of the region's wine specialties that can be tasted at many of the area's wine cellars. -Paris is a 2-hour drive by car or just 55 minutes on the TGV (high-speed train) from Le Mans. -Brittany and Normandy are both within easy reach of the castle. The Château de Launay is a short 20-minute drive from Le Mans. For the automobile enthusiasts, a stay at the Château de Launay around the second weekend of June each year is a must to witness the 24 hours of Le Mans, the world's most celebrated motoring event. The old town of Le Mans and its beautiful medieval historic quarter is one of the preferred medieval and renaissance locations. It is also one of the most filmed in many French movies, including Cyrano de Bergerac which shows the old town extensively. Horseback riding for all levels of competency, including youngsters, is available within 2 kilometers at the outskirt of the village and some of the riding trails border the property of the chateau. Bedroom 5 has a separate toilet, but private, outside of the bedroom. Timeless beauty for a magical Christmas! Our family reunited and gathered around a beautiful Christmas tree and warm fireplaces! We enjoyed the walks in the park and around the property observing the wildlife and many kinds of birds. We loved spending time together in the splendid common rooms and yet enjoyed the privacy of our beautiful and comfortable bedrooms all equipped with a new and elegant bathroom. We plan to come back to the chateau this year or next and this time explore out a little more which may be difficult as we loved being there so much! Review posted for and at the request of Isabelle M.
WE ARE A FAMILY OF !3 THAT CAME TO CELEBRATE THE 80TH BIRTHDAY OF OUR GRANDFATHER. THE SPACIOUS OPULENT SURROUNDINGS AND THE INSIDE OF THE CHATEAU WERE BYOND OUR EXPECTATIONS FOR THE OCCASION. ANNETTE WENT A LONG DISTANCE TO MAKE OUR STAY AS PLEASANT AS POSSIBLE. OUR GROUP INCLUDED BOTH SINGLE ADULTS COUPLES AND YOUTHS AND THE ACCOMODATION WAS TO EVERYBODY'S LIKING..
Usually I would keep my mouth shut to make sure that not too many people develop an interest in spending some days at this wonderful fairy tale castle;-) but that would be unfair. So: we stayed at Chateau L‘Aunay for 8 days during the Le Mans Classic. We, that means: 8 couples from Germany. Each couple could have a very nice double room with a private bathroom (one stayed at the pool house, this is quite simple, but they loved it because it reminded them of their very first holiday experience). We really enjoyed the stay: this time the weather was perfect to hang out at the pool. We had some dinners at a very long table outside, there is a big barbecue, the kitchen is well equipped, two refrigerators f.e. And everything you need to cook and prepare meals if you like. Every day lovely Annette came to prepare The petit dejeuner and takes care for everything else in the Chateau. She is there the whole day so whenever there is a question somebody is there, even with my very modest knowledge of French we could find a way to communicate. She is absolutely lovely and caring. On rainy days you can enjoy the living rooms on the ground floor, with the library and everything. You can feel that this a actually a family home. Le Mans is about a twenty minutes drive away, the next supermarket 5 minutes and the circuit 25 without traffic jam. You can even visit some of the Chateaus in the Loire Valley. All the rooms are different, some have big double beds, some two single beds, the furnitures are differ as well in their style, so everybody should find something they like. All ind all we had a very relaxed stay that we all enjoyed very much. The black swan became our special friend. We stayed there this year for the second time and hopefully will come back. A beautiful fairytale Chateau and so comfortable. The Chateau de Launay was perfect. Grand, but still on a very human scale. Beautiful well appointed bed rooms all with ensuite. Comfortable, attractive, welcoming salon, library and dining rooms. We lunched on the terrace under a tree, we swam in the pool, we walked and cycled. Our guests wrote rave reviews and we had a ball! We are already booked for next year. Thank you, Marie, for all your help before our arrival. The chateau is warm and welcoming. Very comfortable for a large group. The dinners by Chef Bartolin were fantastic. We definitely will return for an extended stay. The Pays de la Loire is the perfect place to escape to whether you're looking for adventure, a journey back in time or a relaxing respite. Waterways offer the tranquility of excursions allowing stops where and when you choose. Nearby river cruises also offer lunch or dinner cruises. Rolling green hills and woods are full of opportunities for horseback riding, biking or gentle strolls. Echoes of history abound in the castles, abbeys and churches, and in the bustling market towns which continue ancient traditions. The beautiful and historic châteaux of the Loire Valley such as Amboise, Chenonceaux, Blois, Chambord, Angers, Villandry and Tours are all conveniently nearby. A visit to the world renowned 11th century Solesmes Abbey, where monks still sing Gregorian chant, will transport you back centuries. Vineyards offer another taste of true French heritage. Initial 25% deposit is non-refundable.